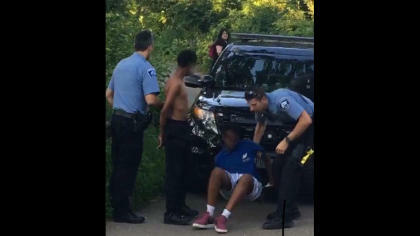 MINNEAPOLIS -- Minneapolis Park Police said Wednesday they are investigating after an apparently unfounded 911 call about an assault led officers to detain four unarmed black teenagers, and led one officer to point his gun at the boys. Park authorities said they were investigating the validity of the 911 call, and are also asking for an independent review into the officers' response to determine whether proper policies were followed. The encounter raised community concerns after a citizen cellphone video was posted on Facebook. The video did not show an officer with his gun drawn, or show anything that happened before the teens were handcuffed. The video shows two boys handcuffed and sitting on the ground outside a patrol car. CBS affiliate WCCO reports two other boys were detained inside the car. Police said the officers' body cameras were activated, but that video isn't being released because it's part of an ongoing investigation, the station reports. Park police were called to Minnehaha Regional Park on Tuesday night after a 911 caller reported an "escalating, dangerous situation and reports of weapons," according to a parks statement. Park Police Chief Jason Ohotto said a female caller reported that four teens were following her boyfriend and wielding knives and sticks. She also reported that one of the teens said he had a gun in his backpack. The information was then updated as the female reported that her boyfriend was being assaulted. The caller gave "detailed descriptions" of the teens, Ohotto said. Police arrived and Ohotto said one of the officers unholstered his firearm and pointed it in the general direction of the teens, who are 13, 13, 14 and 16. Police detained the teens, but no weapons were found. As authorities investigated, Ohotto said some witnesses described a confrontation between the four teens and another person, but their accounts didn't match what was initially called in to 911. Three of the teens were released at the park; one was a runaway and later released. Ohotto said officers were unsuccessful in reaching the 911 caller or her boyfriend at the park or by phone. "I think the details of the 911 call describing knives and guns are what we need to investigate and get to the bottom of," Ohotto said. Making a false report is a misdemeanor and police are asking anyone with information to come forward. "We're going to continue to work hard and hopefully repair any damage that has resulted from this social media posting and the response that the officers made," Ohotto said. "We don't want people to be fearful, especially of our police, if they come to our parks." The station reached out to the bystander who posted the video on Facebook, but hasn't heard back.